Lifewit Thermal Insulation Lunch Box is designed to keep your food fresh and hot or cold. The exterior bag is made of water-resistant 1680D Oxford fabric and the interior lining is made of premium aluminum foil and padded with 8mm EPE foam. 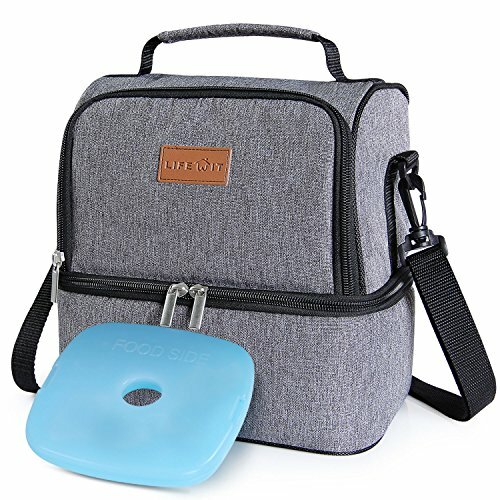 Lifewit Double Decker Lunch Box is equipped with a carry handle for transport, and an adjustable strap to allow you to carry it comfortably on the body. PREMIUM CONSTRUCTIONS & INSOLATION: The exterior of the Lunch Box is constructed out of 1680D water-resistant dirt-proof Oxford fabric for durability and water proofing and easy cleaning. The interior lining was made of food grade aluminum foil and padded with 8mm EPE foam for great thermal resistance. DOUBLE DECKER DESIGN : Featuring two sections which allow you to store hot and cold foods separately. The wide opening allows for easy loading and unloading, and the premium zipper enables effortlessly smooth glide. VERSATILITY : Premium aluminum foil lining offers great thermal resistance to keep food fresh and warm/cold. The bag is suitable to be used as a baby milk bag owing to its double-compartment design. Parents can store baby essentials in the bag and separate them from the foods. COMPREHENSIVE DESIGN : Seamless one-piece aluminum lining elimates leakage problems, classic adult looking grey appearance with a padded handle and a detachable/adjustment shoulder strap that you could carry it in 3 modes?crossbody, shoulderbag and handbag, totally customizable for your different needs. MEASUREMENTS & CAPACITY : The Lunch Bag's maximum capacity is about 7L. The overall dimensions of the lunch bag are 9.84*6.69*10.23 in / 25*17*26 cm ( L*W*H ). The top compartment could take at least 6 tins of coke and the height of the bottom section is approximately 4.33 in / 11cm. It's roomy for even the whole day food that you need.